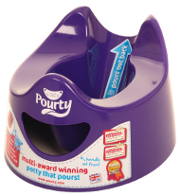 The Pourty potty won Best New Product to Market 2010/11 and is consistently rated 5/5 in potty reviews for quality, value for money and ease of use. The Pourty Potty offers the convenience of a basic potty, is as easy to empty as a two piece potty and its unique one piece design makes it more hygienic and easier to clean. It works amazingly well on babies and toddlers to gently and effectively eliminate cradle cap and keep it at bay. The bristles are soft and soothing yet firm enough to massage the cradle cap away in a safe and kind way. Parents who hate cradle cap will love this revolutionary brush. 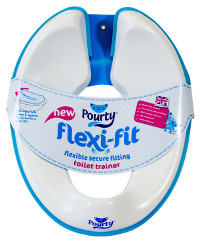 The Flexi-Fit has a unique squeeze flex action and adjustable prongs so that it fits securely on to the toilet seat. Adult toilet seats come in many shapes and sizes. However, most toilet training seats have no size adjustments so they can wobble around and make the child feel uncomfortable and insecure. It is sturdy and stable and strong enough for an adult up to 80 KG and has a safe non-slip top and base.